The “Sheriff” football club gives much attention to development of child’s – youthful football. Therefore, on August, 16th, 2003 the “Sheriff” football academy was found. Today more than 400 children at the age from 7 till 17 are trained in elements of football. 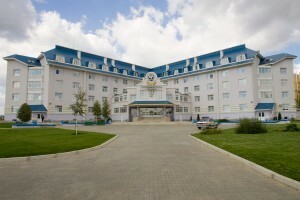 Under the football academy there is the hotel with comfortable living rooms on 2 – 3 persons, 4 VIP – numbers for guests of honor, up-to-date educational classes, a conference – hall for 150 persons, medical insulator, two saunas, working rooms for trainers, tutors and methodologists, administration and players of teams coming to the sports complex for training camp. The hotel is intended for 200 persons. Sportsmen take food in food complex which is able to serve more than 300 persons simultaneously. It is equipped with modern equipment and located in the Football Academy building. Highly professional cooks of the food complex can cook meals considering dietary habits of sportsmen. The food complex menu consists of fixed breakfasts, dinners and suppers with various choice of dishes of European cuisine and other world countries. The food complex has two halls: big one (for 180 seats) and small VIP-hall (for 80 seats). Material and technical support of teams corresponds to problems raised to the Academy. All groups train in the “Sheriff” sports complex. 8 playing fields with high quality synthetic and grassy surfaces, gyms, a pool, start of functioning of which is planned on December, 2011, football theory classes, comfortable dressing-rooms, shower cubicles, saunas are at the disposal of teams. Young players are delivered to the football academy by club buses. Educational programs are learning in specialized classes of Tiraspol schools. Forming of socially active person, promotion of healthy way of life. The main aim of the football academy is training football players who will win world level tournaments. Therefore, individual development of children, training players with high versatile physical training, which master all methods of high speed art irreproachably and in single combat with rival conditions, competent tactically with effusive manner of play – these are priority direction in the Academy work. With that end in view all teams of professional Academy play in the championship of Moldova against teams that are elder for a year, and teams of youth Academy alternate games for getting more resistance from rivals. Visit the “Sheriff” football academy web-site for detailed information.